Independence Day of the People's Democratic Republic of Algeria is celebrated on July 5. It commemorates the independence of Algeria from France in 1962. Algeria was conquered and colonized by France in 1830. Algeria became a home for hundreds of thousands of French settlers. Colonial authorities confiscated communal land from indigenous peoples and devoid local Muslim population of economic and political status. Tensions between the Muslim population and Pied-Noirs (people of European ancestry) eventually led to the Algerian War of Independence. On November 1, 1954, guerillas of the National Liberation Front launched a serious of attacks against military and civilian targets throughout Algeria in what is now known as Touissant Rouge (Red All-Saints' Day). In March 1962, France and the Provisional Government of the Algerian Republic signed the Évian Accords that ended the war. Algeria was pronounced an independent country on July 3, but the Algerian government officially recognized independence on July 5, 1962, the 132nd anniversary of the French invasion. 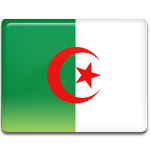 Algeria Independence Day is a public holiday marked with speech by the President of Algeria, flag hoisting ceremony, parades, singing the national anthem and patriotic songs, and other festive events and activities.